Yemeni Drone Strikes Saudi Military Gathering In Asir 5 out of 5 based on 7 ratings. 7 user reviews. Illustrative image, source: al-Masirah TV. On January 24, the Yemeni Air Force [loyal to the Houthis] attacked a gathering of the Saudi military in the Kingdom’s southern province of Asir with an armed unmanned aerial vehicle (UAV), according to the al-Masirah TV. “The aerial attack targeted a gathering of the Saudi military … Killing and injured many of its personnel,” a pro-Houthis military source said. The Yemeni Air Force didn’t reveal the type of the UAV that was used in the attack. 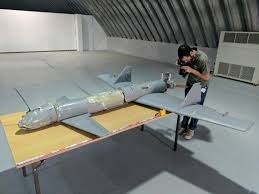 However, experts believe that it was the Qasef-2k, which is an upgraded copy of the older Qasef-1. The UAV is armed with a heavy high-explosive fragmentation (HE-frag) warhead that explodes 10 to 20 meters over the target. Last week, Saudi-led coalition warplanes carried out dozens of airstrikes on alleged positions of the Houthis in the Yemeni capital of Sanaa in an attempt to cripple the growing capabilities the Yemeni Air Force. Despite of Saudi aerial attacks, the Yemeni Air Force is apparently still capable of operating UAVs in an offensive manner. This represents a major failure for the Saudi-led coalition. Although the media calls this a civil war, it’s really just another American invasion( using Arab cannon fodder), another failed American invasion. The empire is starting to crack, if the free world keeps up the pressure, at some point the Zionist empire of America will collapse. There is nothing civil about any war and killing of human beings. THERE IS NO ZIONIST EMPIRE OF AMERICA…..
alcohol( a very important part of mind destruction/Control) Bronfman Family etc..
Again… the britihs elite is the upper Echelon of Control, and the Zionist jews have Junior Partner Level Control of some imporatant parts of Society. just some very small examples of thousands to understand..
ALL USA presidents share kinship, belonging to the same general ancestry, often called the 13th Illuminati bloodline, the Merovingian line, and/or the Windsor bloodline. George W. Bush himself is directly related to 16 former U.S. presidents including George Washington, Millard Fillmore, Franklin Pierce, Abraham Lincoln, Ulysses Grant, Rutherford B. Hayes, James Garfield, Grover Cleveland, Teddy Roosevelt, William H. Taft, Calvin Coolidge, Herbert Hoover, Franklin D. Roosevelt, Richard Nixon, and Gerald Ford. Even Bill Clinton and Bob Dole, who ‘opposed’ each other at the 1996 election, are distant cousins. They can trace their ancestry to England’s King Henry III, who reigned from 1227 to 1273, and US Presidents William Henry and Benjamin Harrison …Clinton has far more royal blood than Dole and is directly descended from the same bloodline as the House of Windsor, every Scottish monarch, and King Robert I of France. According to the New England Genealogical Society, Ellen DeGeneres and the Duchess of Cambridge are 15th cousins as they are each direct descendants of Edward III of England. DeGeneres is also the 19th cousin, twice removed, of Queen Elizabeth II. Celine Dion is 11 th Cousins to camilla parker bowles (all of them Madonna,celien and camilla are decendants of the Cloutiers!!!! Beyonce is the 25 th Cousins of queen elizabeth II…Henry the second is ancestor tto both women!!! Brad pitt is 25th Cousins to king Henry II, as also a Cousin of General Robert e lee. this could go on and on and on and on……if u hav´nt caught the dirft yet, dont bother trying!!! In 2019 soon you all will hear that Saudi morons fucked seriously. The Saudi cowardly scum are being humiliated every day and want a way out, but Americunt and NATO support and MBS idiots big ego is keeping this needless war in the poorest country going. The Ansarollah simply can not be defeated and the moronic Saudis have to come to grips with a costly defeat or worse disasters will come if they keep on bombing Yemeni civilians. Saudi atrocities are the best recruitment tool for the Ansarollah. Yemen is a Geographically significant location that the West is about to lose.